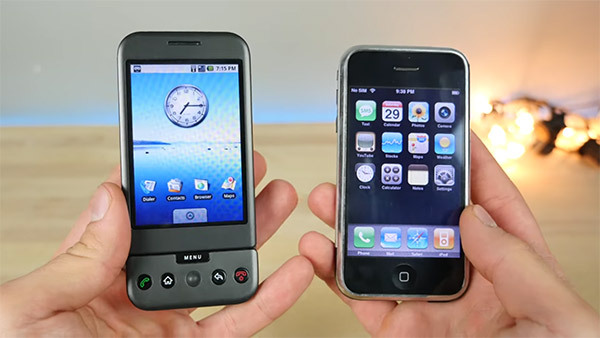 Here’s a comparison between the original 2007 iPhone 2G Vs the very first Android phone, the HTC-manufactured Google G1. As the tenth anniversary of the iPhone edges ever closer, everyone is getting all nostalgic for that original device and what it brought to a smartphone industry that didn’t really exist before Apple gave us the device that ended up taking the world by storm. What most forget is that the year after the iPhone was introduced, Google also took a stab at the smartphone market with the G1, the first Android device to be sold. It was built by HTC, marking the beginning of a partnership that still lives on today with the 2016 Pixel phones being built by HTC as well. Both devices of yesteryear had their positives and negatives, and we have them both to thank for the awesome phones we’re using today no matter which side of the iOS and Android debate you land. In fact, we don’t think either device gets enough credit, and it seems one YouTuber agrees. So much so, that we now have a new video to enjoy in which an original iPhone and an HTC G1 are shown off in all their glory. The video, which runs for a lengthy ten minutes, shows the original iPhone and the HTC G1 together, giving many people their first glimpse of the smartphones that started it all many years ago. There will be a large percentage of Android users who have never seen, let alone used, a G1 whereas the original iPhone is now so iconic that you would be hard pressed to find someone who hasn’t at least come across the device that started it all even if they have never touched one. Remember, some smartphone owners were kids when the iPhone and G1 were released! If you have a spare ten minutes, we suggest you make a drink, sit back and reminisce about a time where things were much more simple. They were worse, admittedly, but this is long before all the Android vs iOS hatred began, and a very long time before Apple and Samsung fell out so badly. They actually look at comments? What.